who else is starting to notice the lighter nights, and the warmer weather and the daffodils popping out around us? With spring approaching it means we can officially start looking into our new spring 18 wardrobe! I’m already wish listing the hell out of all my favourite retailers as I can’t wait for my new spring wardrobe. Sadly I’m on a strict clothing, ban due to me finally taking a diet serious in hope of loosing a bit of weight before my holiday! So let’s discuss this dreamy jacket. It was a Saturday I was enjoying having a Saturday off (I’m still very happy about having weekends off) I decided to pop into Birmingham as it had been so long since I’d had a shopping trip is my home away from home. it was 3 for 2 on all H&M sale. winner winner, chicken dinner. Luckily I spotted a few items before coming across this dreamy jacket. I wasn’t in the market for a green blazer, if anything I just wanted a plain stamens black blazer. But once my eyes spotted this beauty, and of course I tried it on. Damn I was sold. The blazer was originally £69.99 and I got it for £20! what a bloody bargain! For me this blazer was also a piece for in a long time, I’ve picked dup and honestly just fell in love with. I paired the blazer with my high waisted trousers from Riverisland, and my other bargain from Zara. I’ve brought this for my holiday but I liked the edgy young feel it added to the outfit. should of been £12.99 down to £1.99. The problem with a blazer is you don’t want to look too smart. You want it to look smart, but also chic and cool at the same time. I think by adding the blazer with the leather trousers and the top it really took it away from making the look, look too “I look like an estate agent”. Like I said in a previous post how I get my inspiration, Pinterest really inspired me to create this look. Sadly the blazer isn’t online, so be sure to check your local H&M’s! below I’ve listed some similar. The colour of this blazer is just heaven! I love the way you’ve styled it! I am obsessed with the colour of this jacket ! It suits you so well too – and I can definitely see it looking stunning in spring ! I have spotted the lighter mornings too – but for now they are just too cold ! Spring needs to start asap! I never thought I needed a green blazer until now. I seriously love this look, babe. Adore the dreamy green blazer, bold, bright and very on trend for SS18. 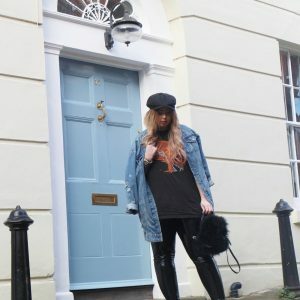 Love how you styled the outfit, great post dear!